This article discusses the warm-ups conducted by elite and professional athletes, and also provides a practical model which can be used by anyone. Considering a well-planned warm-up has the potential to not only prepare athletes physically and mentally but also possess the ability to reduce the likelihood of injury and improve performance, highlights its significant importance in athletic development. This article discusses the current warm-up practices conducted by elite and professional athletes, and also provides a new modified model of the RAMP protocol developed by Dr. Ian Jeffreys. The practice of ‘warming-up’ has been universally accepted for a very long time. While the general principles surrounding the need to warm-up remain valid, in recent years there is growing evidence which questions the usefulness of historic warm-up methods and introduces potential areas for future development. Improvements in the rate of force development (9). A 15-minute warm-up performed 4 x per week for 12-weeks = 12 hours of training time. Over a 12-week training cycle, the exercise professional can utilise an additional 12-hours of high-quality training time. This further demonstrates the importance and potential of a strategic and effective warm-up. It should be the aim of the exercise professional to have the athletes fully prepared both mentally and physically following the end of the third phase (i.e. potentiation phase) of the RAMP protocol and ready for competition or activity. Each of the three phases of this warm-up model plays an important role in the athlete’s preparation. These exercises may be used for the majority, if not all of the athletes competing in the same training session or activity. However, after the generic group movement exercises have been completed, stricter attention should be paid towards individual preparation requirements. For instance, this may involve exercises prescribed in the athlete’s prehabilitation programme such as specific joint mobilisation exercises, glute-ham exercises, mini-band routines, rotator cuff exercises, balance work and so on. Incorporating these exercises into the warm-up may result in better time utilisation, and therefore perhaps lead to a reduced injury risk and improved performance. 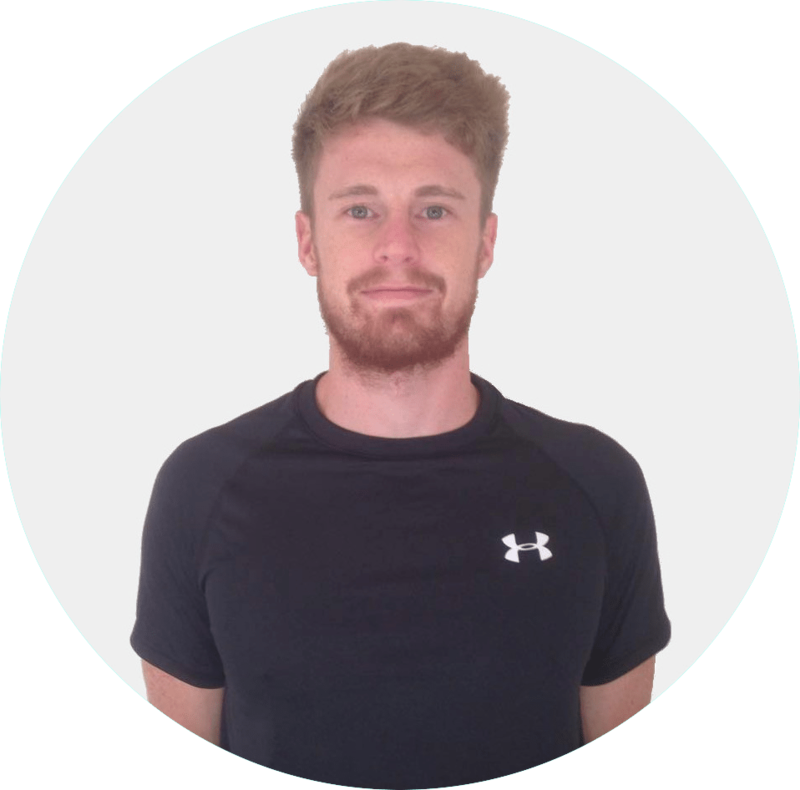 When designing the activation and mobilisation phase, it is essential the strength and conditioning coach carefully considers the fundamental movements and demands imposed by that particular sport or activity. For example, what fundamental movements will occur during a rugby match, or during an Olympic Weightlifting session in the gym? This will allow the coach to be very specific with the movements/exercises selected for the warm-up, and therefore have the best possible chance to effectively prepare the athletes for training or competition and preventing them from injury. It is encouraged that coaches develop numerous exercises that activate and mobilise the same key muscles, joints, and ranges of motion which can be used for training variability to prevent monotony and emphasise performance improvements. In addition, some exercises may irritate or be painful for some athletes, so having an assortment of backup exercises for the same joints and muscle groups is vital. The aim of this phase is to ‘prime’ the athletes for their session or competition. ↑ Intensity to a comparable level the athletes’ are about to compete in. ↑ Improve subsequent performance utilising the effects of post-activation potentiation. Therefore, the content of the potentiation/performance phase will see high-intensity drills which are highly specific to the sport. For example, the potentiation phase of a sprint session may include sprint-specific drills such 5-10m accelerations, rolling 30-40m sprints, plyometrics and so on. In team-based sports such as football (soccer), this may include the use of plyometrics, reactive agility drills in a chaotic environment, and sprints using various intensities and distances. After the completion of these three phases and gradually increasing the intensity of the exercises as the warm-up progresses, the athletes should be sufficiently prepared physically for the forthcoming session or competition. Though there are no guidelines in this model in regards to the duration of each phase, this is something that should be tailored by the strength and conditioning coach based on the several factors such as time availability, the athlete’s physical requirements, and content of the main session – to name just a few. Further information on time management for the warm-up is provided in later sections of this article. Notice how static stretching was not mentioned or included throughout the performance preparation procedure. This has perhaps been the largest debate with regards to warming up over the past several decades. Although it has always been a cornerstone component of warming-up as a method to decrease injury risk and improve performance, there is little evidence, if any, to indicate that pre- or post-exercise static stretching reduces injury (12, 13, 14, 15, 16). Additionally, there is growing research to suggest that pre-exercise static stretching also compromises subsequent performance by reducing force production (17, 18), power output (19), running speed (20), reaction time (21), and strength endurance (22). Dynamic stretching, however, has been consistently shown to improve subsequent performance (20, 23). Additionally, because dynamic stretching requires the muscle to activate through a range of movement, it is believed that this contributes to the neural activation requirements of warm-ups. As a result, dynamic stretching may be the most appropriate form of mobilisation during warm-ups for most activities and sports which are dynamic in nature. For a more detailed discussion on stretching and its effects on performance, click on this link – ‘Stretching for Performance’ – coming soon!. To plan an effective warm-up, the strength and conditioning coach must first understand the mental, physiological, and biomechanical demands of the training session or sport before they attempt to prepare the athlete for these precise demands. In most circumstances, these demands are identified during the need analysis. For example, if a strength and conditioning coach is planning a warm-up for some 1-repetition maximum (1RM) testing, then they might want to consider what the mental, physiological, and biomechanical demands of that session are. For mental preparation, the coach may encourage the athletes to arrive well-rested and to bring personal self-motivating music to listen to whilst testing – as this has been repeatedly shown to improve performance (24). To prepare them physiologically, the coach may adopt a warm-up routine with mimics’ similar physiological demands to 1RM testing, such as high-force/strength, long-rest exercises. In terms of biomechanical preparation, stretches, dynamic movements and exercises similar to those being performed during testing would be appropriate (e.g. back squatting). Alternatively, if a strength and conditioning coach is designing a pitch-based warm-up for a ‘short and sharp’ technical session for football (soccer), then the warm-up should be designed specifically for that session and therefore may look very different to the previous 1RM testing example. The mental preparation may likely be very different, as the players’ mental readiness may be stimulated by competing against other players – as an example. Physiologically, if the technical session demands high-work volumes with short recovery periods, and thus a high cardiovascular demand, then the warm-up should aim to produce similar or even replicate the intensities the athletes will be exposed too. From a biomechanical standpoint, the adopted movements should have biomechanical similarities to the movements which will be prevalent during the technical session. This may include things such as lunges, directional changes, jumping, and twisting movements. 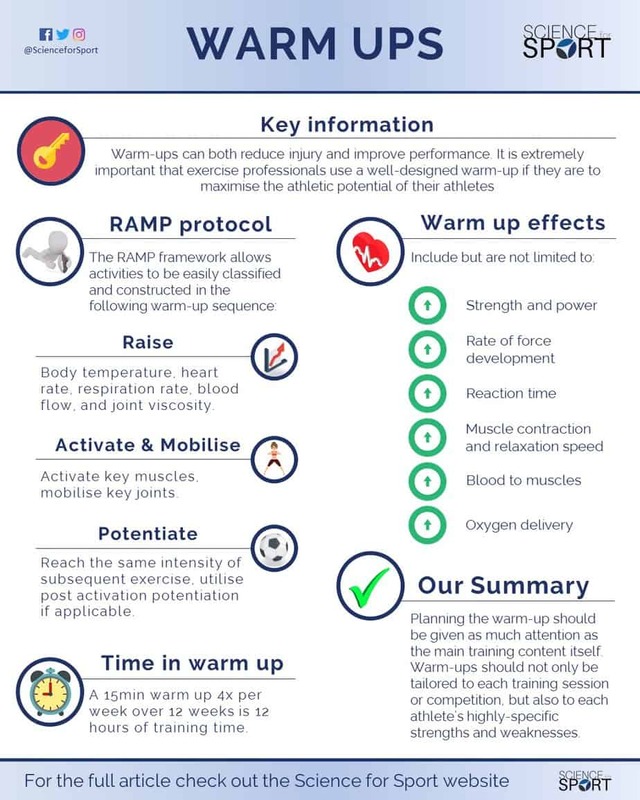 Remember that the warm-up can be structured effectively and strategically using the RAMP protocol and that the content/ exercises should replicate those of the session the athletes are preparing for. As mentioned previously, as the training time for each warm-up can accumulate to a large number of training hours over a long period of time, finding ways to optimise a performance gain from the use of a warm-up may be extremely beneficial. One way to structure a warm-up in order to optimise its effectiveness is by adapting the RAMP protocol and adjusting the ‘Potentiation’ component to have a larger ‘Performance’ improvement emphasis. The strength and conditioning coach may, therefore, direct more attention towards improving athletic performance during the warm-ups, rather than simply preparing them for their session. This method simply attempts to maximise training efficiency and effectiveness. Sport-specific activation and mobilisation movements such as: glute-band circuits, superman’s, lunges, squats, sumo shuffles, spinal mobilisation exercises. *The time spent one either of these qualities should be dictated by the athlete’s competencies at performing them. For instance, an athlete who needs to work on their change of direction mechanics should spend more training time on this component (e.g. an 80:20 change of direction speed:reactive agility ratio). Though the performance component may only comprise 10-minutes of the warm-up, constructing a warm-up in this way optimises the athletes total training hours over a long training cycle – e.g. 10mins x 4 days a week for 12 weeks equals an extra 8-hours of performance-based training. 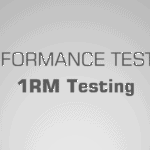 The performance component (e.g. agility, plyometrics, or speed) can, and perhaps should be changed regularly. For instance, weeks 1-4 of a training cycle may focus on speed development, whilst weeks 5-9 may focus upon agility development. Alternatively, the coach may wish to change these performance components on a daily basis. Whereby training day 1 (e.g. Monday) may focus on speed development, and training day 2 (e.g. Tuesday) may focus upon plyometrics and so on. The coach may also wish to be more specific with their approach and tailor each performance component of the warm-up to each athlete’s individual needs. This performance-based modification of the RAMP protocol should, in theory, maximise training efficiency, and thus optimise the overall training effect – meaning a greater improvement in athletic performance can be achieved. However, this is subject to the design and facilitation of the warm-up. Though there is little scientific justification for this particular training protocol at present, it does provide a well-planned and strategic example of a new performance-based approach to warm-ups. Planning the warm-up should be given as much attention as the main training content itself, and the content of the warm-up should be relevant and harmonious to the specific training session objectives. For example, a training session that is primarily focussed upon maximising an athlete’s explosive jump capacity (which will include the use of plyometrics) should incorporate the use of ‘priming’ exercises such as lower-limb movements (e.g. squats and lunges), hopping, jumping, and landing. All of which should be progressively planned and translate unidentifiably into the main content (exercises) of the session. Because well-designed warm-ups have been continuously proven to reduce injuries and enhance performance, exercise professionals should pay great attention to the objectives and content of every warm-up delivered. Furthermore, warm-ups should not only be tailored to each training session or competition, but also to each athlete’s highly-specific strengths and weaknesses. If you’re reading this now, then you’re obviously dedicated towards the development of your athletes and towards improving your own knowledge. As a coach, one of the worse feelings you’ll experience is that concern of losing athlete ‘buy-in’ when they ask you a question and you don’t know the answer (e.g. “coach, if our glutes aren’t activating, then surely we’d fall over? So why do we do glute “activation” exercises before training?”). So, if you don’t want to lose athlete or staff ‘buy-in’ and trust in your knowledge and competencies, then keep your knowledge up-to-date with the latest information by checking out our monthly sports performance research review. Download your FREE COPY of our monthly Performance Digest. Strength and conditioning entails many, many topics. By choosing to simply read up on Warm-Ups and ignore the sea of other crucial S&C topics, you run the risk of being detrimental to your athlete’s success and not realising your full potential. To make you an expert coach and make your life as easy as possible, we highly suggest you now check out this article on Youth Strength Training. If you liked this article and found it useful, then please share it.